For the kickoff of Microsoft's annual North American TechEd conference, the company is urging administrators and IT professionals to think of it as the provider of the "Cloud OS." Microsoft announced a sweeping range of updates to its line of enterprise software, all aimed at bridging on-premises systems with cloud services offered by Microsoft and its service providers. It also announced updates to its Azure cloud service. "If you step back and [see] what is fundamentally happening in the industry, the definition of the operating systems is changing and expanding. Its role is to provide an abstraction layer between the application and the hardware, but it has to do that at the scale of the data center or the cloud, not at the level of the individual server," said Brad Anderson, Microsoft's corporate vice president of Windows Server and System Center, in a press conference that followed the opening keynote. Among the new releases announced were the introductions of Windows Server 2012 R2, System Center 2012 R2, Team Foundation Server 2013, a new version of Windows Intune and SQL Server 2014. All but SQL Server 2014, which will be released early next year, will be available as preview editions by the end of the month and generally available by the end of the year. Many of the features make these products work with Microsoft's Azure cloud service, or a company's in-house cloud service, more handily. For instance, Windows Server 2012 R2 can accelerate the speed of VM (virtual machine) live migration. Through the use of de-duplication technologies, the migration process can only move those bits that are unique to each VM, saving the time of copying the parts of a VM that are identical across all instances. It also uses the RDMA (remote direct memory access) protocol to further cut migration time. Between the two technologies, VM live migration from one server to another can take only half as long as the previous methods used in Windows Server, noted Jeff Woolsey, Microsoft principal program manager, who was one of the presenters in addition to Anderson at the keynote. Windows Server 2012 R2 also offers automated storage tiering, which will help organizations manage large amounts of data more easily, without the help of SANs (storage area networks). With this feature, the server can recognize which data is being accessed the most and move it to the fastest hard drives, such as solid state drives, to improve performance, Woolsey noted. To help organizations come to terms with the idea of the Cloud OS, Microsoft plans to release the Windows Azure Pack for Windows Server. The Azure Pack includes a number of tools that will allow organizations to offer their own in-house services as cloud services, as well as bridge management of in-house resources with Azure-based resources, Anderson said. It includes a portal that users can use to manage the IT for their own projects. It also provides tools for high-density hosting of applications on a single server as well as for managing configurations of user systems. Microsoft also announced price changes to its Azure cloud services. An announcement from Scott Guthrie, corporate vice president in the Microsoft developer division, that Microsoft would bill on a per minute granularity for usage of stock VMs was greeted with enthusiastic applause. Previously, bills were rounded up to the nearest hour. Now, if a VM only runs for six minutes the customer will be charged only for six minutes and not a full hour, Guthrie said. Per-minute billing would save a lot of money for developers, who could do lots of short tests on Azure. Guthrie also announced a number of Azure discounts for members of the Microsoft Developer Network. The Hyper-V Recovery Manager is another new Microsoft service. It runs as a service on Azure, though organizations can use it to manage in-house VMs. If the administration's primary system goes down, the administrator can use the service to start copies of the VMs that reside elsewhere. "Disaster recovery has never been this easy," Woolsey said. In addition to Azure, Microsoft is offering other cloud services through Intune, its Internet-based computer management service. Developed for small offices with limited IT help, Intune provides a set of automated updating and management functionality for keeping Windows-based business computers in operating order. A quiet success for Microsoft, Intune now is used by over 35,000 organizations, according to the company. This new version of the service can now manage Android and Apple iOS devices, helping administrators work with their employees' consumer mobile devices, a trend known as BYOD, for bring your own device. Molly Brown, principal development lead at Microsoft, showed how an employee can access internal IT resources, through a new feature called "workplace join." In conjunction with Windows Server 2012 R2 and System Center 2012 R2, Intune can allow these devices to tap into internal company VPNs (virtual private networks), access data files and download enterprise apps from an app store. When the employee leaves the organization, Intune can wipe the organization data, leaving the personal data untouched. Iain McDonald, Microsoft director of program management for Windows core, also previewed a number of new features with the Windows 8.1 update, due to be released in preview form on June 26. This version will come with a new Bluetooth peer-to-peer protocol called Miracast, which allows devices to wirelessly send video and screen images to another device, without the help of a router. 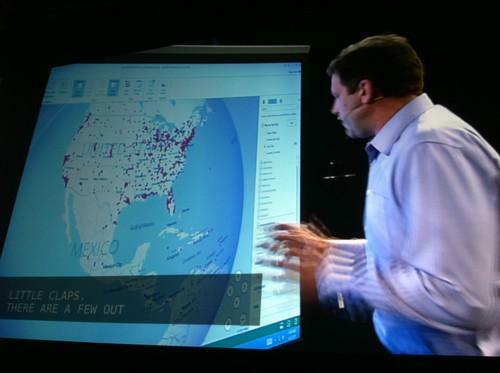 Miracast would provide an easy way to show PowerPoint presentations in a conference, McDonald noted. Windows 8.1 will also come with a new way to send documents to printers, through use of NFC (near field communication). McDonald was the unfortunate presenter this year to be plagued with the nonworking demonstration that always seems to haunt keynotes, Microsoft's in particular: He attempted, but was unable, to show how the NFC printing would work. But McDonald had plenty of other new Windows 8.1 features to share. It will offer the ability for other devices to tether to a Windows 8.1 device's Internet connection. On the administration side, the live tiles on the new interface can now be locked down by administrators, which can be handy for work computers with fixed tasks. The company is preparing a Windows Embedded 8 Industry version, which will offer additional administrative capabilities for workplace usage. With the release of this Windows 8 update, Microsoft will also provide an API (application programming interface) for third-party system and device management software providers. It will allow developers to build VPN connectivity directly into their applications, which will provide better security for sensitive enterprise applications, as well as support of virtual smart cards, also new with Windows 8.1. With Visual Studio 2013, developers now can test their applications in the cloud, using the same set of configurations they might have on-premises. Visual Studio 2013 will also come with a feature called "Head's Up Display," according to Microsoft technical fellow Brian Harry. "Head's Up Display" provides a set of in-line annotations for each block of code, showing when it was last modified, and by whom, if it had passed the last round of testing, and other pertinent bits of information. Team Foundation Server 2013 will provide more information for development project managers. It will offer a collaboration space where team members can share notes. It will feature "hierarchical backlogs," that offer detailed and summarized views of how a project is progressing, including the backlog of features, who is working on them and how the work is progressing. Microsoft revealed a bit of acquisition news in the developer realm as well. It is acquiring InCycle Software's InRelease business unit, which provides a way to manage developer workflows of creating new software from development to production.